Fluviicola taffensis O'Sullivan et al. 2005 belongs to the monotypic genus Fluviicola within the family Cryomorphaceae. The species is of interest because of its isolated phylogenetic location in the genome-sequenced fraction of the tree of life. Strain RW262T forms a monophyletic lineage with uncultivated bacteria represented in freshwater 16S rRNA gene libraries. 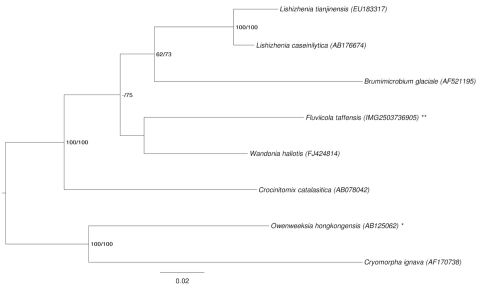 A similar phylogenetic differentiation occurs between freshwater and marine bacteria in the family Flavobacteriaceae, a sister family to Cryomorphaceae. Most remarkable is the inability of this freshwater bacterium to grow in the presence of Na+ ions. All other genera in the family Cryomorphaceae are from marine habitats and have an absolute requirement for Na+ ions or natural sea water. F. taffensis is the first member of the family Cryomorphaceae with a completely sequenced and publicly available genome. 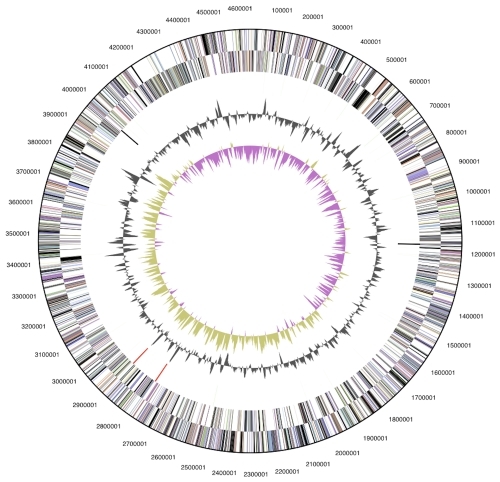 The 4,633,577 bp long genome with its 4,082 protein-coding and 49 RNA genes is a part of the Genomic Encyclopedia of Bacteria and Archaea project. Strain RW262T (= DSM 16823 = NCIMB 13979) is the type strain of the species Fluviicola taffensis, which is the type species of the monotypic genus Fluviicola , affiliated with the family Cryomorphaceae . The genus name is derived from the Latin words fluvius, meaning 'river' and -cola meaning 'inhabitant, dweller', yielding the Neo-Latin word Fluviicola, the river dweller [1,3]. The species epithet is derived from the Neo-Latin word taffensis, referring to the place where the type strain has been isolated, the river Taff (Wales, UK) [1,3]. The family Cryomorphaceae belongs to the class Flavobacteria which contains many species that probably play an integral role for the flow of carbon and energy in the marine environment . Flavobacteria are the major decomposers of high-molecular-mass organic matter in sea water . Phylogenetically the family Cryomorphaceae is located between the families Flavobacteriaceae and Bacteroidaceae  and currently comprises the genera Brumimicrobium, Cryomorpha and Crocinitomix , Owenweeksia , Wandonia , Fluviicola  and Lishizhenia . The family Cryomorphaceae exhibits the greatest degree of phenotypic similarity to the family Flavobacteriaceae  and includes species with a mostly rod-like to filamentous morphology; cells are usually non-motile or move by gliding and often contain carotenoid pigments [1,2]. All members of the Cryomorphaceae are strictly aerobic or facultatively anaerobic (fermentative) with a chemoheterotrophic metabolism [1,2] and often have complex growth requirements for sea water salts, organic compounds as sole nitrogen sources, yeast extract and vitamins for growth . To date no further isolates of F. taffensis have been reported. Here we present a summary classification and a set of features for F. taffensis RW262T, together with the description of the complete genomic sequencing and annotation. A representative genomic 16S rRNA sequence of F. taffensis RW262T was compared using NCBI BLAST  under default settings (e.g., considering only the high-scoring segment pairs (HSPs) from the best 250 hits) with the most recent release of the Greengenes database  and the relative frequencies of taxa and keywords (reduced to their stem ) were determined, weighted by BLAST scores. The most frequently occurring genera were Brumimicrobium (62.9%) and Fluviicola (37.1%) (3 hits in total). 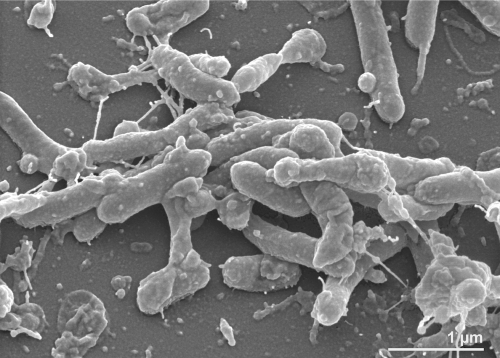 Among all other species, the one yielding the highest score was 'Brumimicrobium mesophilum' (DQ660382), which corresponded to an identity of 92.1% and an HSP coverage of 58.0%. (Note that the Greengenes database uses the INSDC (= EMBL/NCBI/DDBJ) annotation, which is not an authoritative source for nomenclature or classification.) The most frequently occurring keywords within the labels of all environmental samples which yielded hits were 'lake' (9.1%), 'tin' (3.4%), 'microbi' (2.5%), 'depth' (2.0%) and 'tract' (1.7%) (247 hits in total). The most frequently occurring keywords within those labels of environmental samples which yielded hits of a higher score than the highest scoring species were 'lake' (9.2%), 'tin' (3.8%), 'microbi' (2.3%), 'depth' (2.0%) and 'tract' (1.8%) (169 hits in total). The most frequent keyword 'lake' may reflect the freshwater origin of strain RW262T, whereas the keywords 'tin' and 'depth' may allude to some until now unrecognized ecological features of F. taffensis. Figure 1 shows the phylogenetic neighborhood of F. taffensis in a 16S rRNA based tree. The sequences of the two identical 16S rRNA gene copies in the genome differ by two nucleotides from the previously published 16S rRNA sequence (AF493694), which contains one ambiguous base call. Phylogenetic tree highlighting the position of F. taffensis relative to the type strains of the other species within the family Cryomorphaceae. The tree was inferred from 1,429 aligned characters [13,14] of the 16S rRNA gene sequence under the maximum likelihood (ML) criterion . Rooting was done initially using the midpoint method  and then checked for its agreement with the current classification (Table 1). The branches are scaled in terms of the expected number of substitutions per site. Numbers adjacent to the branches are support values from 300 ML bootstrap replicates  (left) and from 1,000 maximum parsimony bootstrap replicates  (right) if larger than 60%. Lineages with type strain genome sequencing projects registered in GOLD  are labeled with one asterisk, those also listed as 'Complete and Published' (as well as the target genome) with two asterisks. Classification and general features of F. taffensis RW262T according to the MIGS recommendations  and the NamesforLife database . Strain RW262T is strictly aerobic, Gram-negative, motile by gliding and flexirubin-pigmented . Cells are flexible rods with rounded ends (Figure 2), 0.4-0.5 µm in diameter and 1.5-5.7 µm in length, with rare longer filaments of up to 51 µm in length . Growth occurs at 4ºC and 20ºC, but not in the presence of Na+ ions . Growth of strain RW262T at 4 ºC is only weak, so that F. taffensis should not be considered to be psychrotolerant like the other members of the family [1,2]. Strain RW262T is capable of DNA hydrolysis , is catalase positive but oxidase negative, able to catalyze the hydrolysis of arginine, aesculin or starch, whereas it weakly hydrolyzes gelatine . It is negative for nitrate and nitrite reduction; indole production; β-galactosidase, urease and xylanase activity; hydrolysis of agar, arginine, aesculin and starch; and acid production from carbohydrates . The strain is not able to utilize glucose, arabinose, mannose, mannitol, N-acetylglucosamine, maltose, gluconate, caprate, adipate, malate, citrate or phenyl acetate . However, within the genome are several genes for utilization of complex organic carbon compounds. The strain is resistant to chloramphenicol (10 µg), streptomycin (10 µg), and kanamycin (30 µg) but susceptible to penicillin G (10 units), ampicillin (10 µg), rifampicin (5 µg) and tetracycline (10 µg) . The predominant cellular acid of strain RW262T was the branched-chain saturated fatty acid iso-C15:0 (44.2%) . Unsaturated branched-chain fatty acids, straight-chain saturated and mono-unsaturated fatty acids occur only in lower amounts: C14:0 (3.2%), C15:0 (7.5%), C16:0 (3.0%), iso-C15:1 ω10c (11.8%), iso-C16:1 ω12c (4.9%). Lipopolysaccharide hydroxy fatty acids constitute 20.4% of the total cellular fatty acids, mainly composed of iso-C17:0 3-OH (12.3%), iso-C15:0 3-OH (4.2%) and iso-C15:0 2-OH (3.5%) . F. taffensis RW262T, DSM 16823, was grown in DSMZ medium 948 (Oxoid nutrient medium)  at 28°C. DNA was isolated from 0.5-1 g of cell paste using JetFlex Genomic DNA Purification kit (GENOMED 600100) following the standard protocol as recommended by the manufacturer, but with additional 20 µl proteinase K incubation (one hour) at 58° for improved cell lysis. DNA is available through the DNA Bank Network . The genome was sequenced using a combination of Illumina and 454 sequencing platforms. All general aspects of library construction and sequencing can be found at the JGI website . Pyrosequencing reads were assembled using the Newbler assembler (Roche). The initial Newbler assembly consisting of 51 contigs in one scaffold was converted into a phrap  assembly by making fake reads from the consensus, to collect the read pairs in the 454 paired end library. Illumina GAii sequencing data (801.4 Mb) was assembled with Velvet  and the consensus sequences were shredded into 1.5 kb overlapped fake reads and assembled together with the 454 data. The 454 draft assembly was based on 164.9 Mb 454 draft data and all of the 454 paired end data. Newbler parameters are -consed -a 50 -l 350 -g -m -ml 20. The Phred/Phrap/Consed software package  was used for sequence assembly and quality assessment in the subsequent finishing process. After the shotgun stage, reads were assembled with parallel phrap (High Performance Software, LLC). Possible mis-assemblies were corrected with gapResolution , Dupfinisher , or sequencing clones bridging PCR fragments with subcloning. Gaps between contigs were closed by editing in Consed, by PCR and by Bubble PCR primer walks (J.-F. Chang, unpublished). A total of 161 additional reactions and shatter libraries were necessary to close gaps and to raise the quality of the finished sequence. Illumina reads were also used to correct potential base errors and increase consensus quality using a software Polisher developed at JGI . The error rate of the completed genome sequence was less than 1 in 100,000. Together, the combination of the Illumina and 454 sequencing platforms provided 374.0 × coverage of the genome. The final assembly contained 232,904 pyrosequence and 44,902,395 Illumina reads. The genome consists of a 4,633,577 bp long chromosome with a G+C content of 36.5% (Table 3 and Figure 3). Of the 4,131 genes predicted, 4,082 were protein-coding genes, and 49 RNAs; 49 pseudogenes were also identified. The majority of the protein-coding genes (55.0%) were assigned a putative function while the remaining ones were annotated as hypothetical proteins. The distribution of genes into COGs functional categories is presented in Table 4. We would like to gratefully acknowledge the help of Helga Pomrenke (DSMZ) for growing F. taffensis cultures. This work was performed under the auspices of the US Department of Energy Office of Science, Biological and Environmental Research Program, and by the University of California, Lawrence Berkeley National Laboratory under contract No. DE-AC02-05CH11231, Lawrence Livermore National Laboratory under Contract No. DE-AC52-07NA27344, and Los Alamos National Laboratory under contract No. DE-AC02-06NA25396, UT-Battelle and Oak Ridge National Laboratory under contract DE-AC05-00OR22725, as well as German Research Foundation (DFG) INST 599/1-2. Garrity GM, Holt JG. 2001. Taxonomic outline of the Archaea and Bacteria, p. 155-166. In: Garrity GM, Boone DR, Castenholz RW (ed), Bergey's Manual of Systematic Bacteriology, 2nd ed, vol. 1. Springer, New York.